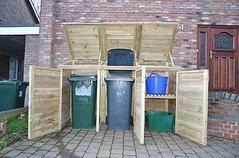 Triple Wheelie Bin Store or recycling box store. Suitable for 3 , 240 litre bins, or sizes up to 240 litres (a 240L Wheelie Bin space is 73cm FtB; 60cm wide; 104cm high). 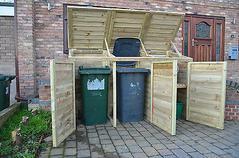 3 spaces for 3 bins or you can add a shelf in each bay for recycling boxes,use the drop down box. This is a excellent way to hide your unsightly bins. 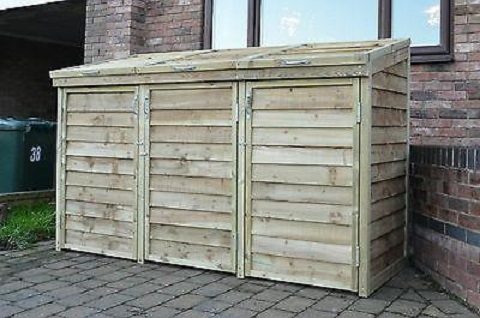 These Bin Stores are very well made, robust for a tough outdoor life, and made from thick pressure treated timbers with galvanised fixings, They will last for many years without any timber treatment required.Each store section has its own roof which you raise to access the wheelie bin. The lid of the bin can be lifted with the roof by a short chain inside the roof so that only one-handed action is needed to raise both the store roof and the bin lid at the same time.Very well made from thick pressure treated redwood timber using exterior coated screws, guaranteed against rot for upto 15 years. 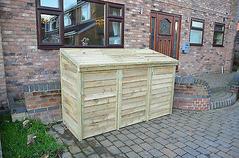 240 litre Triple Store is 86cm front to back; 122cm high; 230cm wide. Please check your bin sizes before purchase. DELIVERY IS FREE to most mainland UK areas (see our delivery page for delivery zones).